Susan Medlock joined Bland Garvey in 1973, becoming a shareholder in 1981 and is currently serving as the firm’s Chief Operating Officer. With a significant practice concentration in privately held businesses and real estate, she provides solid accounting services to mid- to large-sized companies, as well as small businesses and entrepreneurs, with specialized experience in the real estate industry. 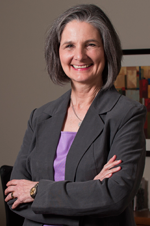 Susan brings many years of diverse experience in public accounting to our clients. She holds a bachelor’s degree with honors in accounting from the University of North Texas. She is a member of the Richardson Business and Professional Women’s Foundation and also sits on the board of the Greater Dallas Bicyclists and RLV Homeowners associations. In her spare time, Susan enjoys athletics such as bicycling and Zumba fitness.